When it comes to choosing cabinets, it is always best to research what you are planning on installing. Every cabinet is made different whether or not they are locally built or manufactured. Every company has different finishes, door styles, and dimensions. Let’s talk about local cabinet shops. If you are planning on purchasing cabinets from a locally owned cabinet shop, take in consideration of these points. Air quality control is a huge factor in cabinet buying. In a local shop, these cabinets are created at the health risks of the employees. Dust particles and VOC’s (Volatile Organic Compounds) cause harm to not only brain cells, but cause eye, nose, and throat irritations. Not to mention, VOC’s are a cancer-causing agent. Dust particles will cause a gritty texture over time. Local cabinet shops, the finishes are either spray painted or stained by hand. Unfortunately, there is a chance these finishes will never cure causing the finish to strip when cleaned, the cabinets are susceptible to staining, and may cause a gummy, sticky texture over time. Local shops tend to have less training and design experience. This means that they can’t show you a wide variety of their product or show you 3D views of what your space will look like through a computer rendering. Warranty plays another major role in the cabinet buying process. Small shops can offer limited warranties on cabinetry. What they can’t guarantee is that they could potentially go out of business. About all local cabinet shops can offer is sometimes a lower price, less quality, less options and very little warranty. Now, let’s talk about manufactured cabinet companies. Contrary to local shops, manufactured cabinet companies make indoor air quality a priority. Mid Continent, a cabinet line we carry at KBC, has a 300,000 square-foot facility with a dust-free environment to ensure the finish gets zero dust and wood particles in the finish. The finishes are 14-16x baked on and powder coated to guarantee durability and stain-resistance. Mid Continent uses the best wood species, durable furniture board, and plywood to make sure your cabinets will last for years to come. 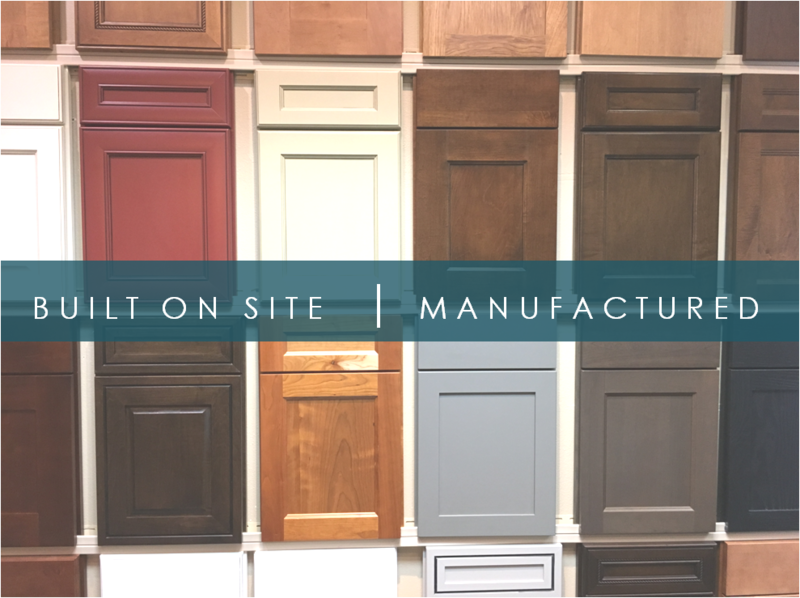 Another advantage to manufactured cabinets is that each manufacturer has their own catalogs in the 2020 program so designers can show their clients a 3-D computer rendering of what their cabinetry, finish, and door style will look like in their space. Manufacturers also have a limited lifetime warranty to guarantee their product. In addition, the cabinets are built only when ordered and only take about 4 weeks to construct and be shipped. With local companies, some delays may occur and they can’t guarantee a lead time or delivery date. In conclusion, manufactured cabinets are the best option with top of the line furniture-grade product, these cabinets are worth every penny and have the highest standard of care and materials.